Not only that, she regularly features a personalized profile of JKT48 members upon request. I really admire her work and the amount of detail and stories that she tells. Fortunately, Sammy has also agreed to allow us to feature these member profiles on our site, and we’re gonna kick things off here with her writeup on Frieska from Team J! Enjoy the article! I’m officially out of requests, so I’m just going at random now! Please please please submit more requests so I can make sure to make profiles of members people are really interested in learning more about~! This time, I’ll be talking about Team J’s Frieska Anastasia Laksani. Nickname = Frieska! Team J’s “my pace” beauty. If “Laksani” sounds familiar to you, you’re not mistaken! Frieska is one of the sisters of JKT48, and her older sister just so happens to be front girl and fellow Team J member, Melody. The two are famous within the JKT48 world as the beautiful sisters from Bandung, Indonesia, and the two of them are incredibly close. They’re always posting photos together and spending time with each other—Frieska shared a recent screenshot of her phone calls and it’s literally nothing but Melody and her mom blowing up her phone, haha! Of course, as sisters, they do have their arguments, but Frieska admitted in an interview that she always feels sorry whenever she gets in a fight with Melody. When the two were auditioning for JKT48, Melody was the one who initially took an interest in auditioning, and because of this, Frieska wanted to audition too. Frieska planned that if she was chosen to join JKT48 and Melody wasn’t, she wouldn’t accept the spot. Luckily, they were both picked for the group and have been there since its first generation! Frieska’s commented on a lot of aspects of JKT48 that she’s enjoyed doing—particularly as JKT48 has been able to gain more popularity within Indonesia and appear in front of more people and on more shows. She’s very proud of everything that they’ve been able to achieve so far. She really enjoys when she gets to tour around with the group, and she’s said that some of her most memorable experiences during her time as a JKT48 member have been filming for TV shows and participating in batsu/punishment games—she finds them hilarious. Frieska thanks JKT48 for helping her to develop more as a performer and claims that she couldn’t really smile in front of many people before becoming a member. While she feels like she’s come a long way, she admitted that she still feels shy at times when she’s performing on stage. Frieska is known as being very calm, cool, collected, and, well, “my pace.” Melody often gets on her case about oversleeping, in fact. She plays a bit of an “airheaded” character, but those close to her have commented that underneath her seemingly oblivious exterior, she’s actually very serious about improving herself as a performer—training to improve her singing and dancing skills in private. Before her debut performance in “Pajama Drive,” she commented that she couldn’t properly learn the song “Two Years Later” and she worked diligently up to the day of the performance. She was super happy when she was able to perform the song perfectly during the actual performance day—so obviously, her hard work pays off! In the most recent Pajama Drive Revival Show, Frieska was voted into the Junjou shugi (centered by Melody, too! ), and she finally got some decent solo lines and you can hear that her voice is really nice! (You can hear her clearly at about 0:48 and 1:32). What’s interesting to me is that Frieska, who, again, is typically stereotyped as an airhead, is actually very practically-minded. 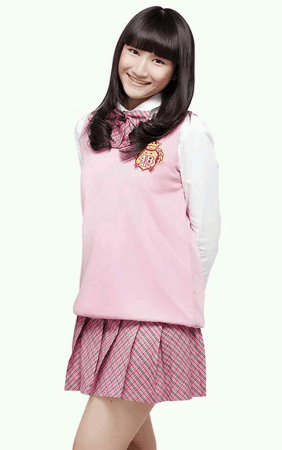 Despite her activities with JKT48, she’s very dedicated to her studies and prioritizes her studies first. She aims to one day be a successful business woman and wants to pursue a degree in International Relations in college. I also love the fact that in her election appeal video, she sat and silently read a book for almost the entire video. Frieska is also a big soccer fan—something that seems to be common in her family, because Melody is, too! Interestingly, Meloday and Frieska support opposing teams, with Frieska supporting Liverpool FC and Melody supporting Manchester United FC. The two often have tweet wars when the soccer clubs face off. Frieska is also a supporter of FC Barcelona, and has gained an interest in the city of Barcelona. Miscellany: Within JKT48, she is closest with Melody (obviously) and was very close with Team J graduate Stella; her favorite color is Brown; she is a fan of Freddie Mercury and John Lennon; she likes Cookie Monster; her charm point is her dimples; she collects sneakers and boots; is very big on good manners; she said her favorite foods are “everything except meat and chicken skin;” likes to sleep on her days off; enjoys going to cafes and admiring views; loves traveling and reading comics; claims that she’s moody and can change her mind easily. My Personal Opinion: Frieska first caught my eye because she is absolutely gorgeous and has such stunning features that I couldn’t help but spot her on stage. Learning about her “my pace” personality really made her a more charming individual, and I like that she’s into travel and wants to pursue studies in higher education to learn more about International Relations—she seems like the type to be very worldly-minded. Her dancing and overall stage presence has improved a lot since her debut, but I’m also sad that Frieska really hasn’t been given a lot of chances to shine. Since joining JKT48 (as a first gen member, mind you) in 2011, she’s never once been in senbatsu. Recently, she was placed in JKT48’s Undergirls unit that covered “Utsukushii Inazuma,” at least! (There are some decent shots of Frieska in this fancam of a performance, the song begins around 6:40.) Additionally, she was given a decent unit in Team J’s most recent DVD in “Rider” (she’s in yellow), so her popularity seems to finally be growing. She’s probably one of my favorite singing voices in JKT48, so I really hope to hear more of her and maybe see her place in the senbatsu election at some point! As always, I hope you enjoyed this JKT48 Member Profile and please please please send me your requests for JKT48 profiles! This was the last request I had, so I’m totally open now! If you’ve got your eye on a JKT48 member and want to learn more about her (or a bunch! ), don’t be afraid to send me an ask, and I’ll make a profile! Requests help me keep up the motivation to continue making these. ;3 Even if you’d like to learn more about a girl you’ve seen in a PV/video/image but don’t know who it is, just send me a link somewhere where I can see it and I’ll identify/profile that member! On an ending note, it is really wonderful to find passionate JKT48 fans such as Sammy. She is doing excellent work in helping to promote JKT48 members, songs and also the fandom to people from all over the world! Many thanks to @ijul_fikar and @Expersia for their contributed photos! P.S: If you would like to volunteer to help translate this article or only the member profile from English to Bahasa Indonesia. do let us know! Feel free to contact us via the contact form or drop a tweet to @jkt48stuff! She just recently posted her responce for this article. I really hope anyone can repost it here as testimonial for JKT48. Aside of that, it’s good to have Sammy as a fan for JKT48. Hope everyone can know JKT48 more through her promotions. hey thanks dai-kun! i’m sure many of her fans will appreciate it! So where should I send the translation? xD;; I should have it ready by tonight. hi dai-kun! you can email me at [email protected] ! thank you! !